In author Dan Sofer’s first novel of the “Dry Bones Society” we learn of Moshe Karlin’s return…from the dead. It takes a bit for him to come to the realization that he had, in fact, died two years before he awoke from his dirt nap. His family and friends moved on and he want to desperately for things to return to the way they were. It’s an uphill battle as he is legally dead and the path is further complicated when other resurrected people start to appear. Will he be able to convince his wife to take him back? This was a very pleasant book to read. Some sadness and a lot of humor. This article was published on Jan 26, 2019 . 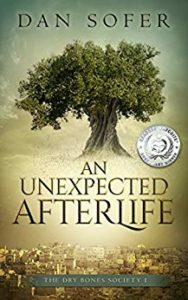 It is tagged An Unexpected Afterlife, dan sofer, dry bones society, moshe karlin. You can follow any responses to this article through the comment RSS feed.